"Fantastic Job!!! Quality and attention to detail is best of class - Turnaround Quick and ahead of expectations - Customer Support 12 out of 10. Wish all transactions and relationships were at this level of excellence." 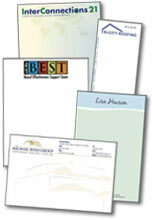 Create professional-quality personalized notepads using your company logo or photos. Custom note pads can be ordered in any size and have a variety of options. Our knowledgeable team can help you find the right solution for your custom notepad printing project. To get started, give our helpful experts a call at 800-­930-2423 or check prices on our standards sizes below. A personalized notepad is a great little advertising device. Take a look at what you have on your desk. Aside from the obvious computer, stacks of paper, maybe a mug of coffee and a few pens, odds are you have a notepad, memo pad or scratch pad. And it is probably from someone else's company. Each day you look at it, use it for a list of the day's events, jot down notes, stats or figures, you are reminded of that company's name and logo. It is like a small, practical billboard on your desk. Everyone appreciates a small, useful pad of paper. Your company name and logo gets attention every time it's used and one of those notes is passed along. "The business notepad is referred to almost daily, kept for 30 days or so and carries a high remembrance factor," says Elliott Black, a Northbrook, Ill., marketing consultant who specializes in small business marketing. The key to printing custom notepads is restraint. Make them stand out but keep them simple. Provide your company name and logo at the top, phone number, address and website underneath; that's it. Notepads are a great prompt or reminder of YOUR company, and possibly just enough to stop a fickle customer from forgetting you, even for a moment. Don't clutter it up, or use up too much of that useful space with catch phrases, designs and borders. It is, after all, a notepad — but that prime real estate at the top is for your business information. See some note pad designs and memo pad design examples. Laying out and printing a notepad or memo pad is very straightforward. Decide on an attractive size, how many pages per pad the total number of pads you want, how much space at the top of the page your information will cover, whether to use color or black ink only, and the type of writing paper. Common notepad sizes are 4.25" x 5.5", 4 x 6", 3.5" x 8.5", 5 x 7", 5.5 x 8.5" and up to 8.5 x 11". Pages per pad range from 25 to 100 or more, and some like to add distinctive details such as rounded corners. Choose easy-to-read fonts that are "sans serif," such as Impact, Arial, Myriad or Verdana, and use white paper — it is usually more cost effective, and shows off any kind of pen, pencil or marker. Visit our Post-it® Notes page for custom printed Post-it® Note Pads. Notepads can be a stand-alone free perk for your clients, or part of a total branding package. This will likely include your business card, brochure, catalog and folder, and other marketing collateral. And many times, the only thing that doesn't go into the trash are the business card and - you guessed it - the notepad. Custom notepads or scratch pads are a functional giveaway your clients will use on a daily basis, and the benefit is the reminder it provides for them to keep you in mind each time their pen hits the paper.